When you begin to create your reality, it may seem daunting, complex, and/or frustrating, but what if you already have the most effective and powerful tool at your disposal? Through exercising control over your language and speech, you can create many powerfully profound changes in your consciousness. By understanding how to accomplish these changes, you can put yourself in a position to be more in control of yourself and your life. Being mindful and aware of these and related subjects, allows you to heighten your awareness to discover that language is one of the most powerful tools you have. Within this book, you will look at applications, universal laws, and address the use of subtleties. This will open the door to profound shifts in not only how you view reality, but also what you can do about it! Oh, this book. To come clean right out of the gate I have to admit that the introduction nearly lost me. I have little interest in having to write a rebuttal regarding the concept of monogenesis, and why it does not make sense to me, in light of the popular ideas of early human migration and development. I have no problem buying the theory that all Indo-European languages have a common ancestor, but the theory that all extant languages in the world have one singular common ancestor is more than I can wrap my head around, especially when we take into consideration extinct languages, extinct human groups who are suspected of having the power of language, and the ever more popular Multiregional Theory. (To be clear: I am firmly in the Multiregional camp, and that certainly colors my view). I almost stopped there. The science was iffy, the author’s explanations cumbersome and not well organized, and we’d already spoken of Atlantis. Did I really want to continue reading this? Well, no. Still, I could not allow my issues with the book, which essentially came down to “he’s not using language the way I think it ought to be used!” be the reason I ceased reading, if my argument was going to be “people use language wrong!” One of my biggest pet peeves is with writers (or people, in general) who treat language like they own it, like it is some fixed, static thing, and as if only those who learn some arbitrary rules can communicate clearly, and those who do not cannot adequately express themselves. That is: I’m against learned snobbery. May seem a bit silly, because I use those rules, and I love learning those rules, and I think dictionaries are great fun to read. But dictionaries are not guides to how languages are; dictionaries are records of how languages might have been, maybe. Language is fluid. If you cannot flow with it, you are hindering your own ability to communicate with others. Language is alive. It’s beautiful. The advice to use your words carefully, mindfully, and with awareness is one that’s near and dear to my heart. Words were the first weapons I ever had, and in my family we spoke to cut more often than not. I’m also a writer. I understand the power of words and the desire to communicate with precision. So, I can get behind this sentiment. What caught me up, throughout the entirety of the book, was the author’s use of obscure words, Scrabble words if you will, while speaking of being precise and of the importance of communicating in a manner that your audience will receive your message. Sometimes being precise does not mean using high point words, and in my mind, clear communication matters more than being precise. Note: I’m all for reading a book with a dictionary at my side. I love learning new words. I only think this language worked against the message and subject of the book. This book needed to be shorter. The author used a lot of words to make his point, again and again, and I think it could have benefited from a heavier editorial hand. The concept is a great one, but the author lost focus more than a few times. Much of the digression could have been cut from the final product. This read a lot like a really excited first run through, and I think the author could have benefited from letting it sit and then going through with an eye toward tightening the material up. I also wish he’d worked in some practical exercises that went beyond things like, pay attention to your tonal pitch, or the vibration level of the words you choose to use. 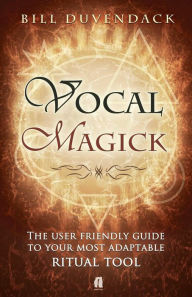 Vocal magick is a fascinating subject, and there is so much one could say about it. One could pull upon the history of chanting, of mantras, of galdr. One could talk about how we speak to each other. One could go on about how our language does, indeed, control how we think, how we are even able to think. I wish so much more from this book. It certainly challenged me to read on despite disappointment, and it did, indeed, remind me that how we use our words are important – I just don’t think the author intended the book to provide such an example of how not to use one’s words.